There are about 250 types of stink bugs in America and any of them can be a problem, mostly in spring and fall when they are leaving or trying to find places to spend the winter. Stink bugs are easy to recognize. These insects have a flattened body shaped like a broad shield, with a small, pointed head and six legs all about the same length. They vary in color, depending on where you live and what kind of trees there are around your home. So they can be bright green, brown, marbled in shades of brown and sometimes have striped legs and antennae. They are often seen walking but they can fly as well. Most of them are between half-an-inch and an inch in length. If you have met one, you will know why they are called stink bugs, because if you squash them or even get them frightened, they give out a nasty-smelling liquid, meant to scare away predators – and it works! The smell can produce allergic reactions in the sinuses or eyes if you are sensitive, and the liquid on the skin can cause dermatitis in some people, so these are not bugs you want to have around. Although there are many native species, some of the biggest problems these days are being caused by the Brown Marmorated Stink Bug that arrived, probably in shipping containers, in the mid 1990’s from several Asian countries. It has spread across the country since then. It is a problem for vegetable and fruit growing, feeding on lots of different plants, such as apples, peaches, corn, peppers and tomatoes. Every fall stink bugs try to get into houses and buildings where they can keep warm for the winter. Once inside they sleep in cracks until spring, when they leave the house and breed on trees and plants growing nearby. Hundreds can suddenly appear in your house and be a real problem – even cats hate them! 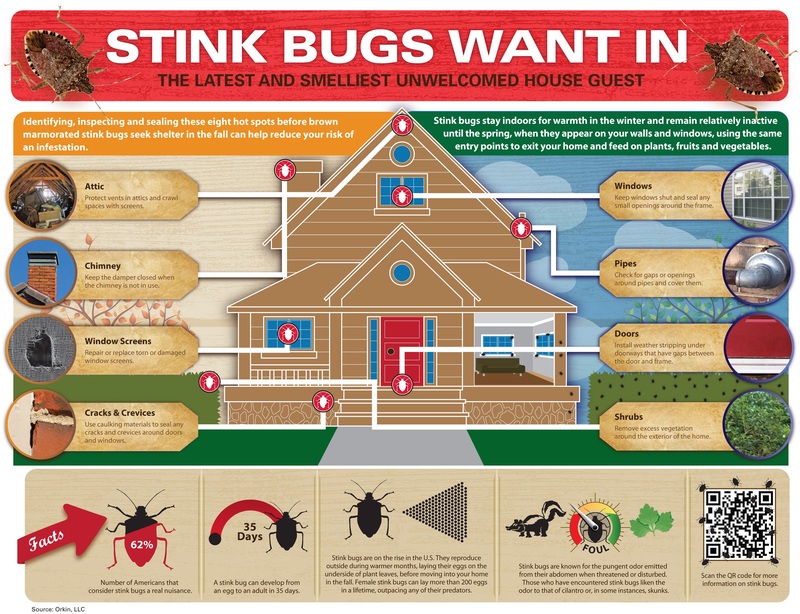 So what to do about stink bugs in your home or garden? You need to do two things to deal with stink bugs in the house – first keep them out and secondly deal with any that get in. September is the prime month for these nasty critters trying to get inside, so as soon as the weather cools down at the end of August, start sealing any cracks around windows or doors and along your fascia boards. If they get inside they will over-winter in the void spaces between your walls. Make sure all your window and door screens are in good shape too. Seal around any ducts coming in or out of your house and close off the vents of your air-conditioners. Large numbers can gather on sunny walls in fall, but as long as they can’t get in they will soon die in the cooler weather. If you do see bugs in your house, don’t start spraying insecticides around – it will do very little good and the dead bugs will only attract other insects that could in turn become a problem. If you just have a few a mixture of 1 part dish liquid to 50 parts water makes a safe spray. However the best control to collect them is with a vacuum cleaner, sucking them out of cracks and spaces where they are hiding. If you have a lot you should not use your regular household cleaner, as it will collect the smell and spread it around. A shop-vac is best, as the drum can be emptied outdoors and thoroughly cleaned afterwards. If stink bugs got into your house and spent the winter there you may suddenly find a lot coming out in March and April, trying to leave the house. Don’t worry, they cannot and will not breed in your house and they want out as much as you want to be rid of them! Again, vacuuming them up is the best solution, but this is a warning you have cracks and they will gather again in the fall if you don’t deal with those cracks and make your home entry-proof. If you’re the do-it-yourselfer there is a simple stink bug trap that is very popular. All it takes is an empty 2-liter soda bottle, tape and an LED light. It’ll cost your roughly around $7 dollars. Some trees are popular with stink bugs, and getting rid of those trees will help keep them out of the house. Manitoba Maple and Tree of Heaven attract many types of stink bugs and these alien trees are weedy anyway, so they should be removed. Black Locust, Ash and Maple can also attract stink bugs and should be planted some distance from your home. For your vegetable garden, if you don’t mind using chemicals look for products containing bifenthrin or permethrin. Remember to follow the directions and wait the necessary number of days before harvesting your crops. If you are an organic grower, hand-picking is a good solution for small infestations – catch them early before they start breeding. That dish-liquid spray or a natural pyrethrin spray is useful too. However if the numbers keep increasing it may be time to start trapping. The best trapping method is simple. Get an aluminium turkey-roasting pan and fill it half-full with water. Add some dish liquid and stir it around. Place the pan on the ground or on a box and set up a lamp with a low-wattage light over the top, so the light shines on the water. Use a regular or halogen light-bulb, not an LED bulb. Turn it on each night and in the morning your tray will be full of drowned bugs. This is a scientifically-tested method that gives the best results possible. You may need to put several traps out. This is also a good way to trap bugs that are in your porches and verandas too. Make sure all your other lights are turned off so the trap acts like a stink bug magnet. 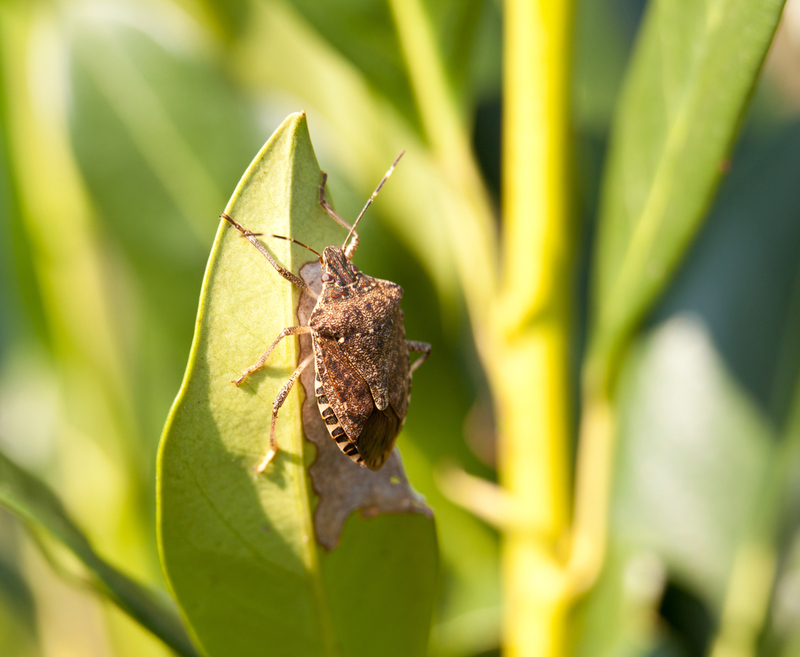 So it may take a little work, but it is truly possible to deal with these horrible stink bugs and rid your garden and home of this menace – you will be glad you did! I have a 100-year-old Maple near my house, its not going anywhere. I set out Bottle traps and pan traps and even spend warm afternoons sucking them into a wet vac with soapy water. I’ve captured thousands this Fall. I need a way to stop them earlier in their reproductive cycle. Your article is 3 years old, hasn’t there been any progress on eradicating this invasive species? From what I’ve read, the commercially available phermone traps are not too effective…What can I do *this* Fall, and next Spring/Summer/Fall? No, there has been very little progress, but then ‘small government’ is always promoted, so where is the funding going to come from? Given the age of your maple tree, it will take years of massive attack early in the year for it to suffer any significant damage. For a tree like that, this is just a nuisance. I realize the Brown Marmorated Stink-bug – which I assume you have (do you live in the mid-Atlantic area?) is unpleasant, and certainly poses a real threat to agriculture – are you in a rural area? – but for your tree, I just wouldn’t worry about it. I know they look pretty gross, but really, spend the time doing something you love.